This Advent I took a vacation. Not a normal vacation, since I didn’t travel, I didn’t stop working, reading, and studying these days. I just made a “trip” in an atmosphere of peace. 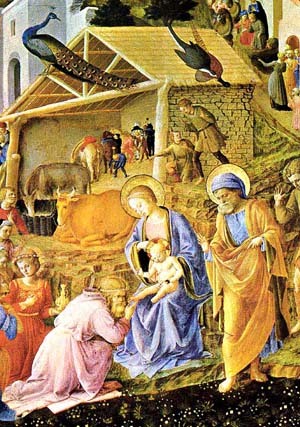 In my library – where I customarily work around 10 hours every day – someone had the courtesy to place a small Christmas tree and the figures of the Manger: the Divine Infant, Our Lady of Bethlehem, Saint Joseph, the three Wisemen and a shepherd. Once in a while I stop working and address a glance at this peaceful ensemble. As we approach Christmas the figurines are becoming more appealing and catching my attention more often. Recently they invited me to stay a little longer with them. My “trip” was of short duration, just the time necessary to take three steps covering the distance that separates the couch where I work from the figurines, which set on a small covered table in front of the fireplace. I knelt at the feet of the Infant-God and stayed a moment immersed in the thoughts that came to me. Those three steps transported me in time. I found myself 2002 years distant in time in Bethlehem observing the same ensemble represented by the figurines, now no longer the symbols, but the reality that they represent. The Divine Infant had just been born. Our Lady was on her knees adoring Him. Saint Joseph was standing close to the Manger, noble, dignified, recollected in thought. Until that moment he had been perplexed by the situation he had faced on this journey. To obey the law, he had come to Bethlehem and brought his wife with him. But no inn, no house opened its door to receive Our Lady in her delicate state. So he had been obliged to go to a stable so that she might at least have the protection of a roof over her head. He fully realized the inconvenience of that situation. He was, therefore, disappointed and humiliated: he had been chosen to care for her, and when she most needed his help he was unable to find a place to make her comfortable. He was asking himself: Why did God permit this? Was it due to some fault of his own? That perplexity increased when he realized that her hour had come. This was the affliction Saint Joseph was passing through several moments before the Child was born. Of course, affliction in the noble soul of this man represented neither revolt nor despair. When Jesus Christ came to light, Divinity became humanity, Heaven kissed the earth, and the divine innocence of that Baby, as a kind of explosion of goodness, spread over the entire world. Everything that was good became better; everything that was bad lost its strength and power to attract – a good tradition tells us that at that moment countless idols representing the false gods broke to pieces all around the world for no natural reason. Earth in many senses became a new Paradise. Some German Christmas songs like Stille Nacht, O Tannenbaum, Es ist ein Ros Entsprungen, among others, retain and transmit the grace of innocence I am trying to describe. Saint Joseph noticed that difference. He noticed that a never-before-seen light irradiated from his foster Son, who lay there, humble and peaceful, in His manger. He also noticed the difference inside himself. The affliction, the perplexity, the moral suffering had suddenly dissipated and a sea of peace inundated the soul of the Patriarch. He was the first, after Our Lady, to realize that change and to feel its effects. Analyzing it, he discerned that this new light and peace were more than natural, more than the normal effects of supernatural grace to which he was accustomed. Rather, a new type of the divine presence had been born with the Infant. Realizing this, he had a profound love and appreciation for it. Inundated by that light and that peace he turned his mind to another order of thoughts. He began to contemplate the great honor he had received in being chosen to be the adoptive Father of Jesus Christ, that is, to assume the highest mission a man has ever received on earth. His elevated and pious heart directed itself to the adoration of God Who mysteriously assumed human flesh and lay there, in the Manger, entirely dependent on the personal care of Saint Joseph. The paradox of having under his custody the One whose power has no limit fixed his spirit in an attitude of extreme respect – adoration – and the most profound gratitude a man conceived in original sin has ever experienced. Even as Saint Joseph reflected, he remained entirely at the service of Our Lady and the Infant, seeking whatsoever he could do to help them. Any need they had, he tried to fulfill, eager to make his God and the Queen of the Universe more comfortable in that simple Stable. The Infant was sleeping, spreading a sea of peace around Him. The Angels were silent, the shepherds contemplative. I finished my meditation, stood up and took the three steps back to my sofa. I had returned to this sad end of the year 2002, bringing from my “trip” a few drops of that sea of peace in my soul, as proof that I had not been dreaming. This Christmas I wish you, your family, and the ones you cherish, dear reader, the same Catholic supernatural peace. And may it be conserved in you throughout the year to come.